The latest data on house prices from the CSO show a further acceleration in the rate of growth at the start of the year. Nationally, prices rose by 12.5% in year-on-year terms in January. This compares to a 8.8% rate of growth in January 2017. Looking at the picture over the last 2-3 years, after slowing to a 5.5% rate in mid-2016, the pace of increase on a national basis has been on an accelerating trend since then, rising to an 11.0-12.5% range since mid 2017. An important feature of the quickening in price growth has been a reacceleration in Dublin, with its annual growth rate at 12.1% in January. This is more than double the growth rate of 5.7% that the Capital recorded in the same month a year earlier. Non-Dublin prices continue to register a higher rate of growth, rising by 13% year-on-year in the .rst month of 2018, and were in double digit territory for all of last year. 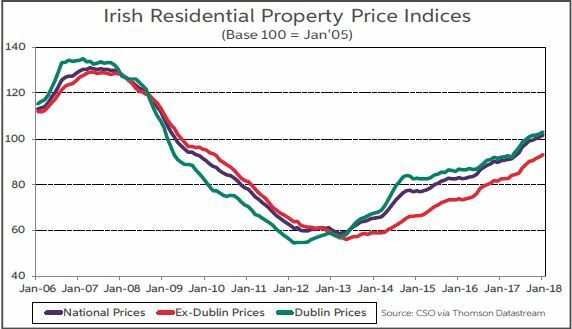 There is some degree of a ‘catch up’ element to the non-Dublin performance, with the start of the recovery in prices lagging behind the Capital. More recently, increasing demand for housing in commuter belt counties, is also likely to have been a factor in the very strong pace of growth in prices outside of Dublin. Nationally, prices are now 73% above their low point, recorded five years ago this month, in March 2013. Prices on a national basis though are still 22% below their high point in early 2007. They would need to rise by a further 30% from their current levels to get back to their previous high. In contrast, rents are now around 20% above their previous peak according to CSO data. Although the rate of increase in rents has moderated significantly over the past year, from 10% to 6%. The key factor behind the on-going high level of house price inflation remains a shortfall in supply. This is highlighted by the very low level of stock that is on the market. The latest Daft.ie figures show that at end-2017 the number of properties available for sale totalled just over 21,000, down from a peak level of 63,000 at the end of the last decade. Meanwhile, the level of transaction activity is still below the regarded 3-4% turnover level of a ‘normal’ market. The supply deficit is also evident in the mortgage market. Mortgage lending totalled €7.3bn in 2017, a 29% increase versus 2016 levels. However, it is still some way short of the level in a more normalised market. Furthermore, recent data indicate a marked slowing in mortgage activity, with approvals in February up just 5% year-on-year in volume terms. Indeed, mortgage approvals for house purchases fell in February on year earlier levels. House building activity, though, is continuing to pick up, albeit from low levels. Using the ESB connections data compiled by the Department of Housing as a proxy, although an imperfect one, of new supply, shows that connections increased by 29% in 2017 to 19,271. Data for the first month of 2018 show the 12 month cumulative total at around 19,500 units. Housing starts (as measured by commencement notices) rose by 33% last year to 17,572 and this strong growth has continued into the start of this year, with the 12 month cumulative total running at around 17,900 notices. Housing registrations, which are a barometer of developer activity, rose by 68% in 2017, but have levelled oA in recent months. Meanwhile, the latest housing sub-component of the construction PMI has increased in the .rst two months of this year, indicating a strengthening in activity. While most of the house-building data are consistent with rising supply, the level of building activity remains well below the projected 33,000 units that are required per annum to meet estimated housing demand. Even if the current growth trend in supply is maintained, it will be 2020, at the earliest, before new house building reaches the level of estimated annual demand. However, this does not take account of the pent-up demand that has been accumulating in recent years. Therefore, it could be well into the next decade before the Irish residential property market is in a situation where supply and demand levels become closely aligned. This suggests that both property prices and rents will continue to rise, specially against a backdrop of rising employment and incomes. However, the rate of increase in rents has already moderated and we expect the same trend to become evident in house prices this year, especially Dublin prices, which have reached very high levels. Buyers in Dublin may struggle to get sufficient mortgage finance given the relatively low loan to income ratio (3.5 times) in the Central Bank’s mortgage lending regulations.